Why Do People Buy Leather Wallets? There are many reasons why people buy leather wallets. Durability is though likely to be high on the list, next to stylish look. What To Have In Mind When Buying Leather Wallet? The most important thing to have in mind when buying leather wallet is the quality of the leather used. Leather is a durable and flexible material created by the tanning of animal skin or hide. Cattle, sheep and pigs hides and skins are common in leather manufacturing but leather can be made from most animal skin, e.g. lamb, dear, crocodile, kangaroo, snakes, etc. Just make sure the leather you buy is not from an animal on the endangered list. That a product is made from genuine leather does not tell you anything about the quality of the leather. It just tells you that the product is genuine leather product, i.e. made from leather of unknown quality. Better quality leather is more expensive but the price alone is no guarantee of the leather quality (you also pay for the brand and other features). Full grain leather is the highest graded leather quality. It involves the least processing, i.e. only the hair is removed from the hide. Full grain leather therefore shows the original texture and marking of the original hide, making it less "pleasing" on the eye than top grain or corrected grain leather that have been treated to remove imperfections. Split leather on the other hand is the most fragile leather type and therefore mainly used in suede products. Top grain leather has been treated to remove imperfections and has greater resistance to staining than the full grain leather. It is therefore popular for top end leather wallets. The less expensive leather wallets tend to be made of corrected grain leather. Other popular types of leather used in wallets include belting leather (thick , firm feel and smooth finish) and napa leather (chrome-tanned, soft and supple). There are more things to consider when you buy leather wallets, like the size, functionality, and style. You can find wallets with special coin compartments and leather checkbook wallet. And how many credit cards do you need the wallet to hold? There are bifold wallets, i.e. folded in two halves, and trifold leather wallets, i.e. folded in three parts… just to name just few considerations. Then there is the finishing. Steady and thick threading is important, as well as the overall craftsmanship. The following table compares some of the main manufactures of quality leather wallets. Just click on the relevant brand name to view the selection of leather wallets on offer. 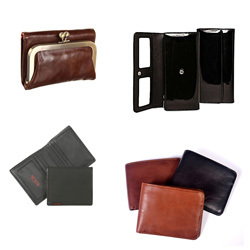 Our price comparison will find you the best price when you buy leather wallets from B for Bag. The price range is simple. The baseline is USD 100. The brand falls under category A if the majority of the leather wallets cost less but category B if the majority costs more. Amazon offers wide range leather wallets and often the best prices you can find. For your convenience, B for Bag has grouped together the most popular leather wallet categories.